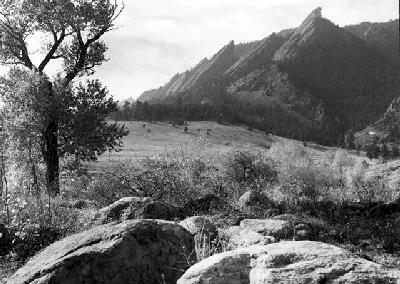 Photo of Flatirons copyright by Denver Public Library. See BASIN Gallery for more. If it is true that our consumptive lifestyle, in combination with a burgeoning world population, is harming our ecosystems and the prospects of a sustainable future, what should we do? Some of us might want to restore the idealized halcyon days of yore, when human, technology-caused changes were slower and, we assume, less harmful. Whether or not humans have in some time past lived more sustainably, we certainly are not doing so now, given the way that we are altering the earth's surface, water bodies, and atmosphere in support of our own material wants. However, we do not know whether we should, and how to, reverse, halt, or even slow the undesirable changes to our collective habitat. If it is true that our consumptive lifestyle, in combination with a burgeoning world population, is harming our ecosystems and the prospects of a sustainable future, what should we do? Some of us might want to restore the idealized halcyon days of yore, when human, technology-caused changes were slower and, we assume, less harmful. Whether or not humans have in some time past lived more sustainably, we certainly are not doing so now, given the way that we are altering the earth's surface, water bodies, and atmosphere in support of our own material wants. However, we do not know whether we should, and how to, reverse, halt, or even slow the undesirable changes to our collective habitat. Our uncertainty about how to take responsible action to mitigate planetary damage arises partly from our lack of agreement about the human contribution to environmental and climate conditions, and also about the ability of both the earth and its inhabitants to adapt to those changes. Geologists' traditional interpretation of earth's history told us that geologic changes affecting climate and ecosystems were relatively slow, allowing organisms to adapt, and that when these changes were too fast, life forms would transform or become extinct. In the geological past, there were times when "fertile" land was reduced to desert, when sea level rose and inundated lowlands, and when the air temperature increased to the point where animal and plant life were stressed. Nobody was there to protect the threatened species. Contemporary humans, in contrast, seem disposed to engineer the earth to suit our perception of "comfort" and "progress". We tend to view extinctions in the geologic record as the consequence of natural geologic processes, yet we resist the idea that either natural or human-enhanced or -induced changes might similarly affect our own species. Contrary to the traditional interpretation of the geologic record, recent studies of ice cores have identified rapid fluctuations in climate over very short periods of time, from years to decades (Severinghaus and Brook, 1999). These data suggest that perhaps our perceptions of rates of change in the geologic past need to be revised. For much of the geologic past, our time markers are few and far apart. Actual rates of some changes may have been much faster than our present ability to define them. Even so, some changes related to the earth may be truly slow by human standards. How do we deal with these conflicting perceptions and realities of the rates of change? The history of many human societies has been one of attempting to control or harness nature, with man using his ingenuity to build levees to contain rivers, build jetties to retard wave erosion, and maintain farmland in the face of water shortages. What are the long-term consequences of these large-scale, engineered interventions? Do they create more harm than the condition we were originally trying to forestall or ameliorate? Do they subject us to using materials and energy for perpetual maintenance of all that we build? Should we put our faith in technology as a panacea, or is that taking too large a risk for future generations, who must live with the results of our choices? As aspiring members of a "civilized" society, we must examine our role as overseers and instruments of change on the planet. We can choose to continue our present rates of unbridled use of earth resources and our alteration of the earth's environments, or we can assume the role of responsible stewards. If our knowledge of the earth has expanded, so must our humility in the face of new theories of complexity, and the chaotic nature of natural phenomena. We have more evidence about the interdependence of all things natural, but less ability to develop precise predictions about the consequences of change. Presumably, if we share the broadest goal of maintaining a modest "comfort zone" for human habitation, we must also seek to learn where our intervention is necessary. We may need to reverse certain deleterious changes now happening to the earth system, based on reasonable scientific judgments and our collective value system. The very realization that we cannot predict the future with certainty suggests that it behooves us to preserve our options – for ourselves, our fellow inhabitants of the planet, and for future descendants of all living species. We need to consider possible effects of large-scale, human-induced changes that might interact with natural processes and magnify the effects. For example, carbon dioxide from human activities could lead to global warming sufficient to cause major shifts in ocean circulation patterns. These shifts, in turn, would drastically affect the productivity of the agricultural land in the circum-Atlantic region (Broecker, 1996, 1997). The geologic record of the last 10,000 years shows that major changes in ocean circulation patterns could be rapid even by human standards (years to decades; see Broecker, 1997, and Bond and others, 1997). Do we understand that we may be contributing to such changes? Do we have a right to cause such major changes that could affect the habitability of large tracts of our planet? Should we try to remove at least the human-induced changes from the trends? These are difficult questions, and involve our most basic values and responsibilities. As we acquire new, reliable data and new insight about earth processes and earth history, we are in a position to make better, informed choices about what changes we might cause or enhance in our habitat. For instance, should we continue down certain potentially harmful paths that accompany our current lifestyle choices? The geologic record shows that change is inevitable. Nevertheless, we can make use of our hard-won understandings of our earth, and the humility that should accompany such understanding. It will take both humility and the thoughtful use of the knowledge that we have acquired, and continue to acquire, to preserve our options for the future. We can thus challenge ourselves to become better stewards of a planet that we inhabit for only a brief geologic moment, for the benefit of future generations of man and of other inhabitants of the planet who cannot protect themselves. Bond, Gerard, and others, 1997, A pervasive millennial-scale cycle in North Atlantic Holocene and glacial climate: Science, v. 278, p.1257-1266. Broecker, W. S., 1996, Will our ride into the greenhouse future be a smooth one? GSA Today, v. 7, no. 5, p. 1-7. Broecker, W.S., 1997, Thermohaline circulation, the Achilles Heel of our climate system: Will man-made CO2 upset the current balance? Science, v. 278, p, 1582-1588. Severinghaus, J. P. and Brook, E. J., 1999, Abrupt climate change at the end of the last glacial period inferred from trapped air in polar ice: Science, v. 286, p. 930-934. DEMONSTRATION 1. Describe two or three man-made changes in the natural world in your neighborhood. When were these made? For what reason? How have they affected the ecosystem and human activities? Are these changes "irreversible", i.e., would it take much longer to reverse them than your lifetime? Why do you say so? DEMONSTRATION 2. Describe two or three NATURAL changes in the world that you observe, or have read about. Are these changes affected by human activities? How do these changes affect human welfare? How do they affect the local wildlife (and what is the composition of the wildlife)? How did you determine that? DEMONSTRATION 3. Find out how geologists determine the rates of change of one natural phenomenon (for example, siltation of a pond, or the rate of sediment deposition along a river), and discuss how precise and how reliable these determinations are.